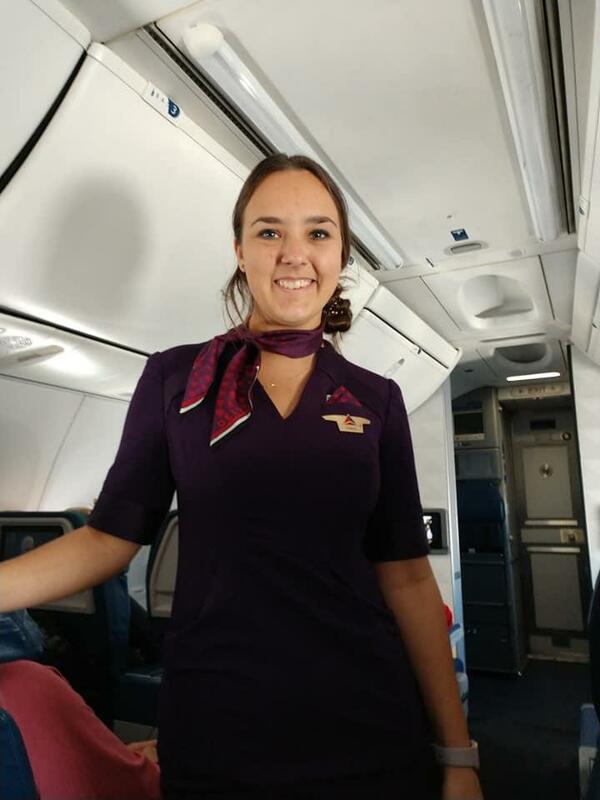 Most stories about flight attendants run the gamut from heroics to downright deplorability, like that one airline employee who saved a girl from being human trafficked, and that infamous United Airlines attendant who was caught being drunk on the job. We rarely hear stories however about people doing nice things for the attendants who take care of us while we're flying in a tin can up above the clouds. In addition to receiving an average salary that wouldn't exactly knock your socks off, flight attendants work some pretty crazy hours — it's the nature of their job. Constantly traveling at all times of the year can take a toll, not just physically, but also emotionally. Not getting to spend the holidays with loved ones can really dampen one's spirit after a while, which is probably why Hal's story is touching so many people. 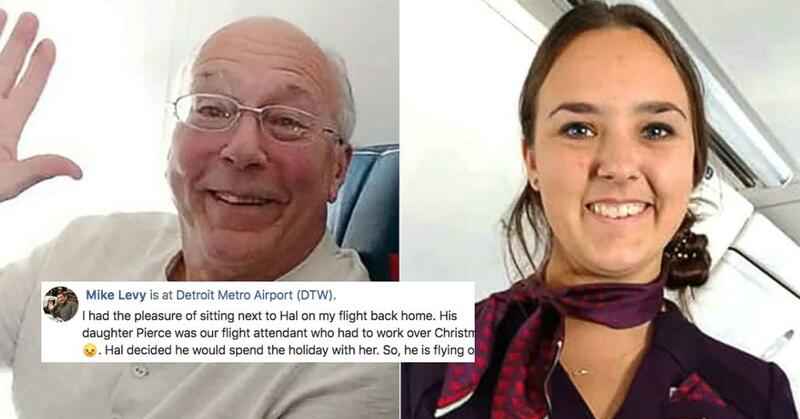 When he found out his daughter, Pierce, had no choice but to work a total of six flights over two days during Christmas, he was sad he wouldn't be able to spend some quality time with her. That is, until he got a bright idea: if Pierce had to be on a plane for two days, then why couldn't he Hal just bring the holidays to her at 33,000+ feet in the air? Andd that's precisely what he did. 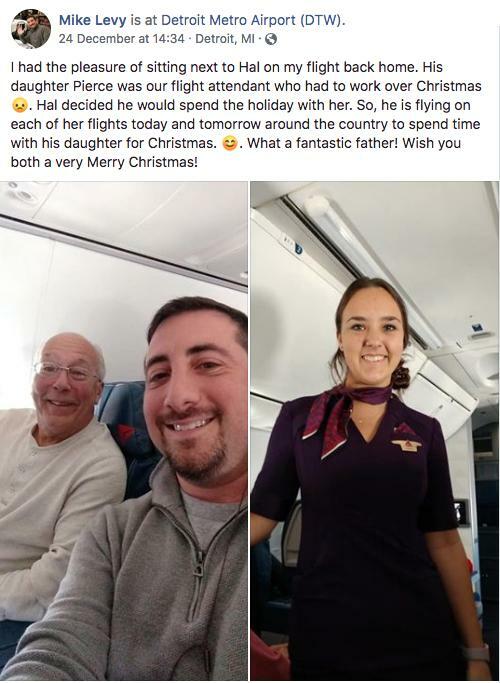 Facebook user Mike Levy shared Hal's tale of yuletide awesomeness when he happened to be seated next to the gentleman during a flight. When he decided to strike up a conversation and ask Pierce's father whether he was returning home for the holidays or going on vacation, Hal's answer surprised Mike. But we're talking one of those good kind of airline surprises, not the ones where you discover your plane needs to turn around because the toilets aren't working. "I had the pleasure of sitting next to Hal on my flight back home. His daughter Pierce was our flight attendant who had to work over Christmas ☹️. Hal decided he would spend the holiday with her. So, he is flying on each of her flights today and tomorrow around the country to spend time with his daughter for Christmas. 😊. What a fantastic father! Wish you both a very Merry Christmas!" It didn't take long for Mike's post to go viral, amassing over 32,000 shares. 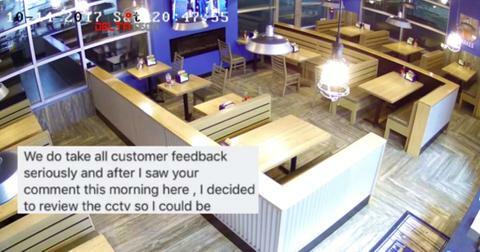 Hal and Pierce became a couple of internet celebrities overnight. 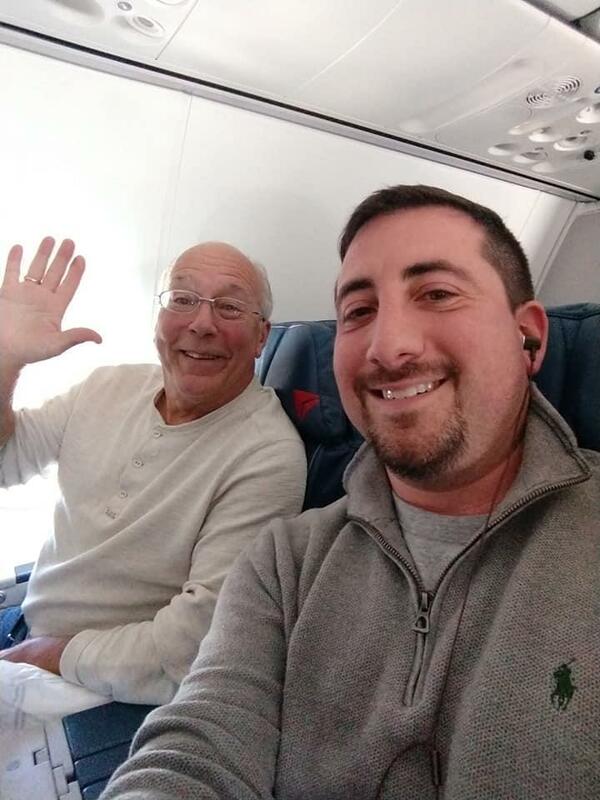 Mike mentioned that as he was sitting on the airplane and waiting for someone to come and sit next to them, he was hoping that a famous person would climb on board and plop themselves right down next to him. Little did he know, he'd help get Hal and Pierce their fifteen minutes. 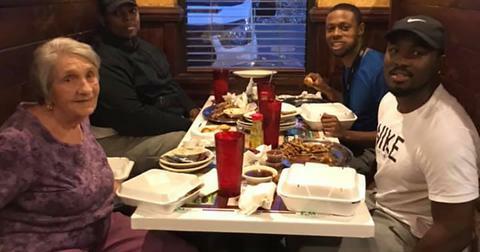 "As I was sitting there waiting for the person next to me to come on the plane, I was hoping it would be some kind of celebrity and I ended up making him celebrity instead," Mike said. Pierce Vaughn shared Mike's post online, and helped answer the question that was probably in a lot of people's heads when this story first broke: how was Hal able to afford all six of those flights, especially around the holidays? If you've ever had the pleasure of flying during Christmastime, not only is every airport an absolute madhouse, but the fares are really high, even if you book far in advance. Thankfully, have a flight attendant in the family has its perks. Using those benefits and flying as a stand-by passenger, Hal was able to afford the trips. 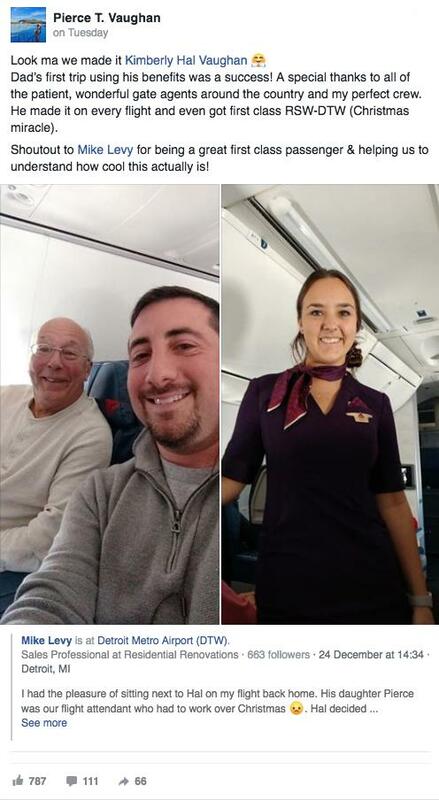 In fact, he even got to fly first class from Southwest Florida Airport to Detroit. Not a bad trip for someone who was literally just along for the ride. According to Pierce's post, Hal also had a little help from the gate workers and her flight crew to make sure he was able to attend all of her journeys. This paints a pretty holiday picture: a bunch of people working together to make sure a father and daughter could have a very special Christmas. 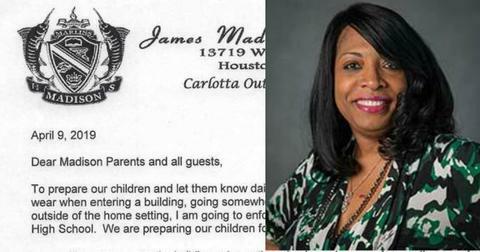 If that isn't a touching holiday tale, then I don't know what is. It's certainly way more feel good than that Robert Zemeckis episode of Tales from the Crypt.